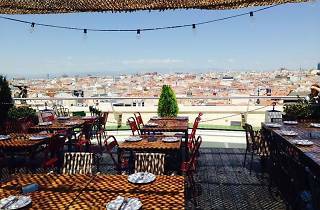 The rooftop of the Círculo de Bellas Artes is perhaps the most famous place to enjoy the views of Madrid. It's mainly divided into two spaces, a place to chill out where you can relax on white sun loungers and a cocktail, and the Tartan Roof restaurant. 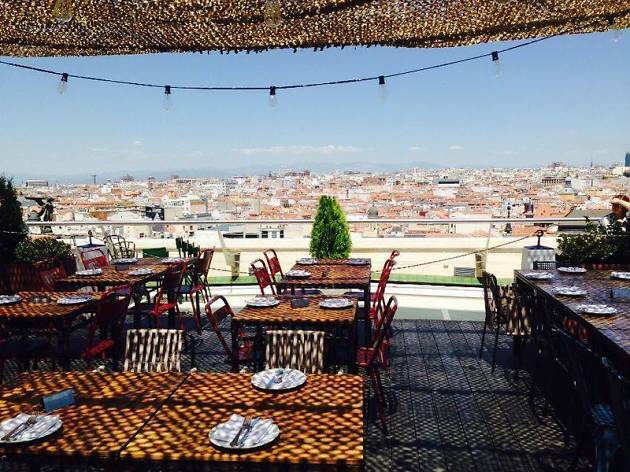 Led by Javier Muñoz-Calero, known for his other projects such as El Huerto de Lucas, the menu of this pop up restaurant is changed every summer, but always has a selection of Mediterranean options. There are meats such as Iberian pork cheek with Thai curry or bass filet marinated with almond jelly, and you can add an Asian flair with their Japanese noodles. It’s sure to surprise! Don’t forget it’s essential to make a dinner reservation.